We are engaged in manufacturing and supplying our clients a very high quality and robust range of Centrifuge Machine. These Centrifugal machines are extensively demanded their high durability, rust resistance, and smooth operation. These machines offered by us are resistant to rust and are very easy to use and install. 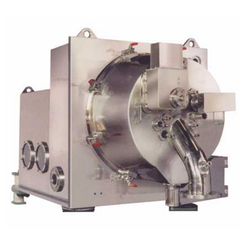 Looking for Centrifuge Machine for Chemical Industries ?